In 1939, it was obvious that Nazi Germany was on the war path. Austria had been annexed just a year earlier, and so was the Sudetenland that belonged to Czechoslovakia. The British and French, who represented the defenders of the 1919 Treaty of Versaille, hesitated, hoping that Hitler’s imperialistic thirst was going to be satisfied by these territorial claims. But on 1st of September, Nazi Germany invaded Poland. The invasion codenamed Fall Weiss (Plan White) included an attack before the official declaration of war. The plan was developed as early as 1928. The invasion also implied on a secret agreement between the Germans and the Soviets, since USSR invaded Poland 16 days after the initial German attack. This violation of international politics would continue all through Hitler’s European campaign, in Belgium, Netherlands, and Luxembourg particularly, where he dismissed the notion of military neutrality of these countries. Since the war began without any official warning, the first skirmish of WWII was fought not by soldiers, but by the employees of the Gdansk (Danzig) Post Office building. At the time, the Free City of Danzig was a semi-autonomous region and a German enclave. The City and its region were under the protection of the League of Nations, created by the Treaty of Versailles as a guarantee that the treaty would not be broken at any of its points. The Polish minority in the city gathered at the post offices, as they were proclaimed exterritorial units of Poland. Sort of like embassies. Hitler already demonstrated his opinion on international politics in 1938, and the Poles sent some weapons caches together with a combat engineer, Second Lieutenant Konrad Guderski to organize an initial defense plan. The plan was intended to halt the Germans in a case of attack and hold them for six hours before the Polish Army could send in reinforcements to the demilitarized zone. Guderski’s second in command was a forty-year-old post office worker, Alfons Flisykowski. Together they prepared the defensive perimeter in and around the building. They cut the trees, to minimize cover for the invading force and barricaded the exits. In mid-August, just before the German attack, ten more employees were sent to the main Danzig post office, as it was obvious that the defense plan was going to be inevitable. Their darkest predicaments had come true on the early morning of the 1st September. With the help of the ethnic Germans in Danzig, a siege was organized. Members of the police office, together with local SS and SA volunteers cut the telephone and electricity line that was supplying the post office building and laid a siege. Three ADGZ heavy armored cars were brought in by the police. Inside the building, there were 56 men. Konrad Guderski, 42 local Polish employees, ten employees sent in from Poland in August, and Bydgoszcz, the building keeper with his wife and a 10-year-old daughter who lived in the complex. Except for Guderski, there were no professional soldiers during the siege. The Germans attacked from two different directions, even entering the building, but were repelled soon after. During the frontal attack, two besiegers were killed, and seven were wounded. The attack from the rear was also repelled successfully. The ineffective charge left the Germans in awe. But during their second attack, the group was better organized, and some Nazi supporters volunteered to assist them. Also, the armored vehicles were put to use. The leader of the group, Konrad Guderski, died during the second attack, by blowing himself up with a hand grenade to slow down the German advance through the building. The attack itself failed, as the rest of the Poles managed to drive out the Germans, even though their commanding officer had been killed. At this point, the siege was well into its sixth hour, but there was no sign of reinforcements. The commander of the Danzig police units, Willi Bethke, proposed to mine the post office and blow it up with its defenders. His idea was initially vetoed by Albert Forster, the head of the Danzig Nazi Party. Soon the besiegers were joined by a Wehrmacht artillery detachment which provided mortar support, but the defenders stood their ground even under shell fire. After another failed attack, the Germans declared a two-hour ceasefire and called the Poles to surrender which they unanimously refused to do. In the meantime, German sappers were already planting explosives on the building’s side wall. The exploding device went off and the Germans finally captured most of the building, but the remaining resistance had withdrawn successfully to the basement, where they made their last stand. Once again they refused to surrender, accepting the consequences, which meant death. Bethke was made so furious by the Polish defiant stand, that he filled the building with gasoline and lit it on fire, burning three of the defenders alive. The rest decided to capitulate to avoid incineration. The first two Poles who went out with a white flag were shot on sight. Six of them escaped, but two were caught the second day. The rest were apprehended and an immediate false trial was organized. The trial – which was a mockery – sentenced the men to death on the accusation they were bandits. Since none of the apprehended was of military affiliation, they were denied the rights given to combatants by the Geneva Convention. The 16 wounded from the post office were transferred to a Gestapo hospital, where they all suffered death, most probably at the hands of the Secret Police agents. Among them was the 10-year-old daughter of the building’s superintendent, Erwina. A similar fate had struck eleven Polish railway workers south of the city after they foiled a German attempt to use an armored train, and were executed by the SA along with their immediate families. The defenders of the Danzig Post Office had held out for 15 hours. The reinforcements never came as they were occupied fighting the Wehrmacht invasion at the Tuchola Forest. 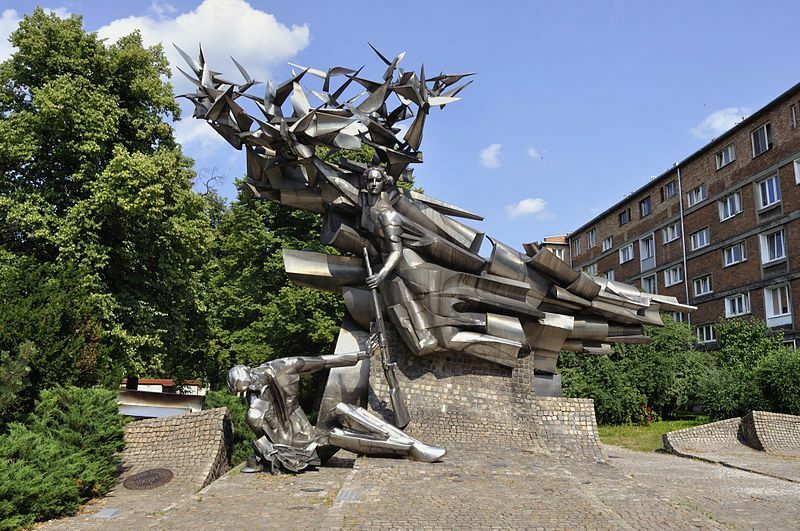 In 1979, in the People’s Republic of Poland, a Defenders of the Polish Post Monument was unveiled in Gdańsk. The ones who died during the siege and the ones who were executed afterward were posthumously relieved of their charges of banditry and rehabilitated.